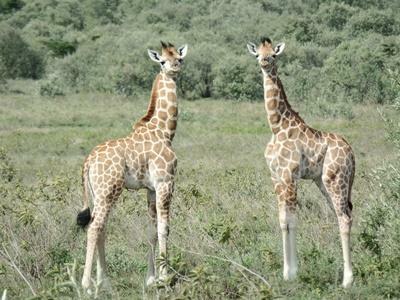 Giraffe Conservation Foundation Africa’s giraffe conservation guide places the population of the Rothschild’s giraffe (Giraffa camelopardalis rothschildi) sub-species at less than 1,100. Furthermore, it highlights that half of this population are in zoos and are classified by the International Union for Conservation of Nature (IUCN) as endangered and feature on the IUCN red list as of high conservation importance. The Projects Abroad conservation project in Kenya conducts surveys to monitor a population of 9 males, 12 females and 7 juveniles. Our volunteers have successfully developed a new giraffe identification kit, which involves taking a photograph of each giraffe from both sides. The giraffe is one of the key species monitored within the protected area, and volunteers conduct their activities in collaboration with Giraffe Research and Conservation Trust. The volunteers and the rangers have been involved in a search as one of the giraffes has not been seen for three months. The female giraffe, which has a damaged hip, has avoided surveillance due to her slow gait and inability to keep up with the herd. This prompted the search team to assess her condition. The good news is that she was spotted browsing alone, but in good form, in the acacia woodland. The monitoring team that spotted the female giraffe could barely contain their joy at seeing “Isabelle”, who had been presumed dead. The two giraffe babies, Leah and Milton, are healthy and under constant surveillance by our volunteers. We recently discovered that “Milton” is not a male as initially thought, which is great news for the giraffe population as it means there is another female to breed with. Recently, they have been spotted alone without the company of their mothers. Motion sensitive cameras have been strategically placed around the conservancy. These new cameras definitely produce a higher quality image than previous models we have used. The data from our camera traps will yield interesting information, which can be used to map the distribution of the leopards (Panthera pardus) and other carnivores in the conservancy. This will give us a further insight into activity patterns of different species. Over the course of June and July, an Italian PRO volunteer spent three days a week leading a team of volunteers in creating an inventory of insects in the conservancy. The study covered all the different habitats in the conservancy and yielded interesting results about the following groups: The cricket, grasshopper and praying mantis (Orthoptera), the beetle (Coleoptera), the membrane-winged insect (Hymenoptera), the ‘true bug’ (Hemiptera/Heteroptera), the moth and butterfly (Lepidoptera), the cockroach (Dictyoptera), the spider (Araneae), the tick (Acari), the termite (Isoptera), the stick insect (Phasmida), the dragonfly (Odonata) and the fringed wing insects ((Thysanoptera). This is a new study in the conservancy and a protocol will be established to ensure the study is undertaken on a long-term basis. In spite of the heavy rains in the area, we managed to plant trees both in the conservancy and in the neighbouring communities. The indigenous fever tree (Acacia xanthophloea) was propagated in our nursery and planted in the conservancy. This is particularly important as the conservancy has a perimeter fence prohibiting populations from leaving when food is in short supply. It is, therefore, necessary to increase the levels of biomass for our herbivores to eat. This species is a favourite of the giraffe and has always been heavily consumed so there is a great need to continually replenish resources. Environmental conservation is vital in Nakuru County with a special focus on the Lake Naivasha basin in which the Kigio Conservancy lies. A solution to some of the deep-rooted problems is the establishment of tree nurseries. This will contribute to the resilience and mitigation of climate change within the basin. Our tree nursery now produces trees for reforestation efforts in surrounding communities, which complements the government’s efforts in undertaking this vital exercise. While indigenous species are replanted in denuded areas in the conservancy, exotic species are produced for agroforestry efforts to supply timber for firewood and trees for erosion control. The goal of the project is to ensure that renewable resources are not consumed faster than they are replaced. Each household receives a minimum of 50 to a maximum of 500 trees depending on the size of their land. The community members are very happy and supportive of this one of a kind initiative. In order for local people to live in harmony with wildlife, the importance of conservation must be stressed to relevant communities. Conservation volunteers participated in educating primary school students from a neighbouring school who visited the conservancy. The conservancy has an on-going programme allowing free entry to school children, and all the students admitted to having never seen a giraffe before. This was a good opportunity for them to experience what nature has to offer. Our volunteers had the chance to educate them on conservation and sustainable solutions. Our team of dedicated volunteers were involved in the maintenance of nature trails and the perimeter fence. This was a great experience for most of the volunteers who had never used machetes before. The result is that the track, which had not been used for a very long time, was made accessible. As a result, a lone female giraffe with a hip problem, which had not been seen since April, was seen feeding in the acacia woodland at the end of July. Nature trails are not only important for tourism but can be very effective networks that are crucial in monitoring endangered wildlife. The conservancy has a perimeter fence and it is important to clear the grass around it to curb poachers from encroaching. 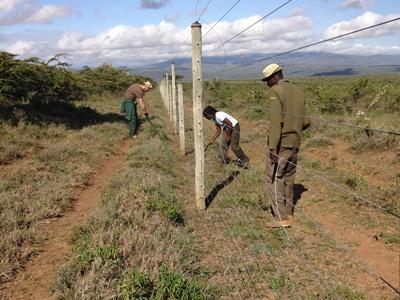 The volunteers worked alongside the rangers to create a 4 metre clearance on both sides of the perimeter fence. Wild animals can see the fence from afar and know to avoid it, which will minimise the occurrence of accidents.